HONG KONG, July 11, 2018 /PRNewswire/ -- On July 11, Ericson Chan, CEO of Ping An Technology, took the stage of Hong Kong RISE Conference for the second time to share how Ping An Technology has found its position and development direction through cross-industry technology fusion. He revealed that the next decade would be about technological revolution, and Ping An Technology would be "multi-focus". AI is the most cutting-edge and one of the most popular technologies at present, but it's not the only one, there are still blockchain, cloud technology and so on. Ping An Technology will build a more mature technological ecosystem and form a positive cycle. 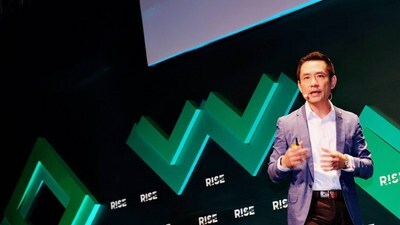 RISE has become a crossroad of the world, where the most influential technology founders, CEOs and well-known investors in the world meet each other. There are about 15,000 attendees from over 100 countries and regions, 71% of them are senior managers, including more than 2,750 CEOs. Participating companies include Samsung, Tencent, Facebook, Google and Amazon. When the world is ushering in a new round of technological revolution and industrial change, technology is being given high expectation to lead the industry change. This year, RISE pays more attention to the future development roadmap of the whole industry, concentrates more on industry exploration and demonstrates technological achievements. In his speech, Ericson Chan introduced that Ping An incubated its wholly-owned subsidiary Ping An Technology in 2008, dedicated to technology R&D and application. After years of exploration, technology has become an important driving force for the development of Ping An. In the past decade, Ping An has invested more than RMB 50 billion in R&D, and relying on innovative technologies including artificial intelligence, intelligent cognition, blockchain an Ping An Cloud, its applications have covered more than 400 scenarios inside and outside the Group, and formed five ecosystems including finance, healthcare, automobile, real estate and smart city. Ping An is exploring a new development path of "technology enables finance - technology incubates ecology - ecology feeds finance". Comparing the traditional service model as an iceberg, Ericson Chan explained that, in traditional business scenarios, the enterprise only focused on single service and was sales-oriented. But with the fusion of AI, blockchain and cloud technologies into traditional industries, the value under the water could be gradually exploited, showing great application value. For example, Ping An has applied big data and AI technologies to insurance survey, and the surveyor can arrive at the scene in 5 minutes, which has greatly improved the service efficiency. The sales-oriented service model is changing towards a service-oriented model. Benefitting from the application of a number of cutting-edge technologies, Ping An has formed a huge ecosystem covering 173 million individual customers and 459 million Internet users. Today, Ping An Technology has filed more than 5,000 patents, and there are more than 200 application scenarios for the facial recognition technology alone. These technologies are helping build smart cities too. For example, Ping An smart healthcare platform, with leading AI technology as its core and Ping An Cloud as its carrier, provides government agencies and medical institutions with a one-stop solution. In smart disease prevention, Ping An Technology has cooperated with Chongqing CDC and Shenzhen Municipal Health and Family Planning Commission. The accuracy of influenza and HFMD prediction models has reached more than 86%, and the prediction accuracy of high incidence season has reached more than 90%. Ericson Chan hopes that one day they can "predict the incidence of influenza like a weather forecast". "AI+environmental protection" is also emerging. An environmental protection data center platform has been integrated based on global leading technology advantages. Ping An Technology has reached cooperation with environmental authorities of some cities in China to build environmental data centers, integrate environmental business data, realize unified planning of environmental protection information, and use big data and AI technologies to intelligently process and analyze the environment. A new era is about to begin. How will the technological revolution and industry change redefine the world? Facing both opportunities and challenges, each industry will make efforts to explore the fusion of strategy and technology. Ping An Technology, a wholly-owned subsidiary of Ping An Group, is committed to using AI, intelligent cognition, blockchain, cloud and other cutting-edge technologies to create a new cloud-based life for people. As a subsidiary, Ping An Technology is the high-tech core and tech business incubator among Ping An Group, and be responsible for the development and operation of the critical platforms and services for Ping An Group. As an independent entity, with smart technology as a means and smart manufacturing as a blueprint, Ping An technology focuses on the finance, healthcare and smart city areas, applies the technological capabilities certified by international authoritative certifications to actual business scenarios, creates a closed-loop ecosystem, and actively practices the corporate philosophy of changing life with technology. More than 4,000 IT professionals and management experts form a high-level R&D force to provide expert-level technical support for the stable and reliable operation of the platform. The established cloud ecosystem has already carried over 400 million of Internet users.